I might sound like I am praising my own self out here since I was the host at this barbecue but I am sure my guests would support me on this as was evident on their happy faces when they parted. I have been wanting to host a barbecue ever since I moved into this building which houses two fantastic gas-barbecues at the podium level. 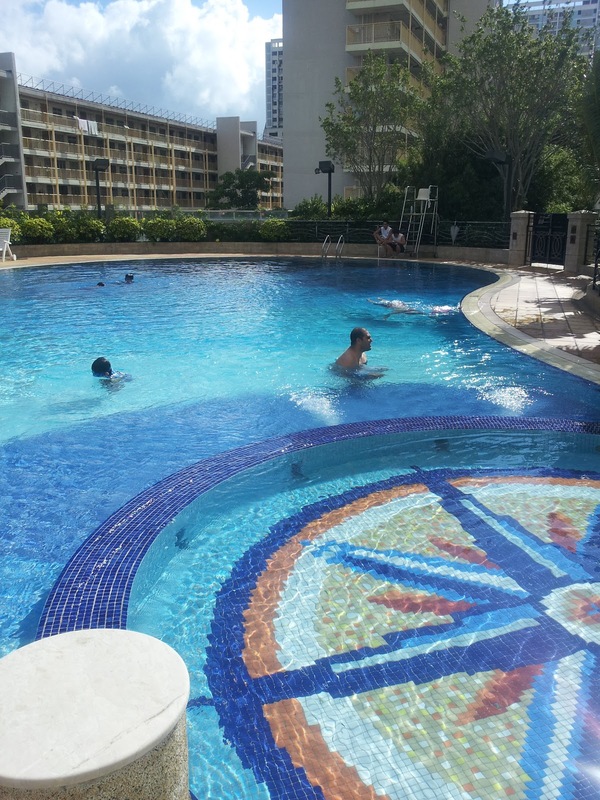 First our excuse was winter, then I cut my thumb, then we were waiting for the pool to open so we could have a swim and barbecue, then things got a bit busy and finally once when we did plan a barbecue – we got rained out! 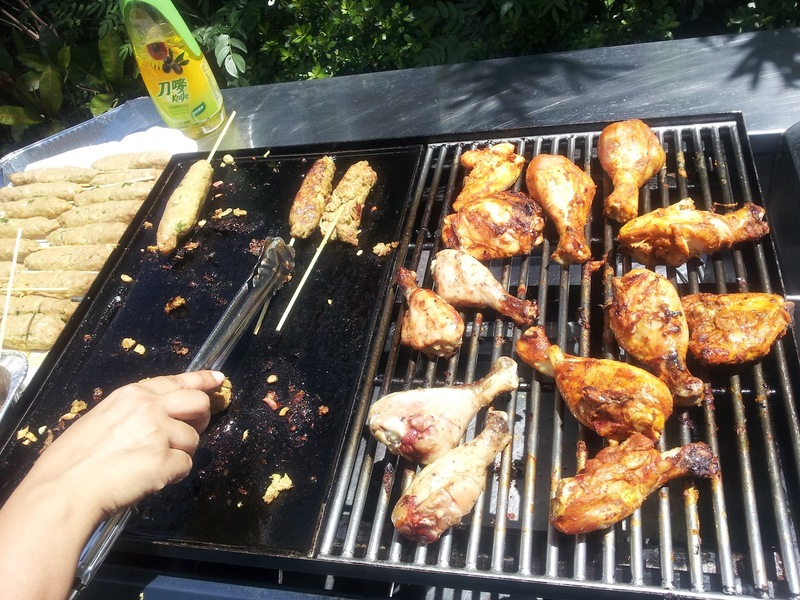 But two weeks later the barbecue (bbq) did happen, hosted by me and like I had anticipated it was SO much fun! 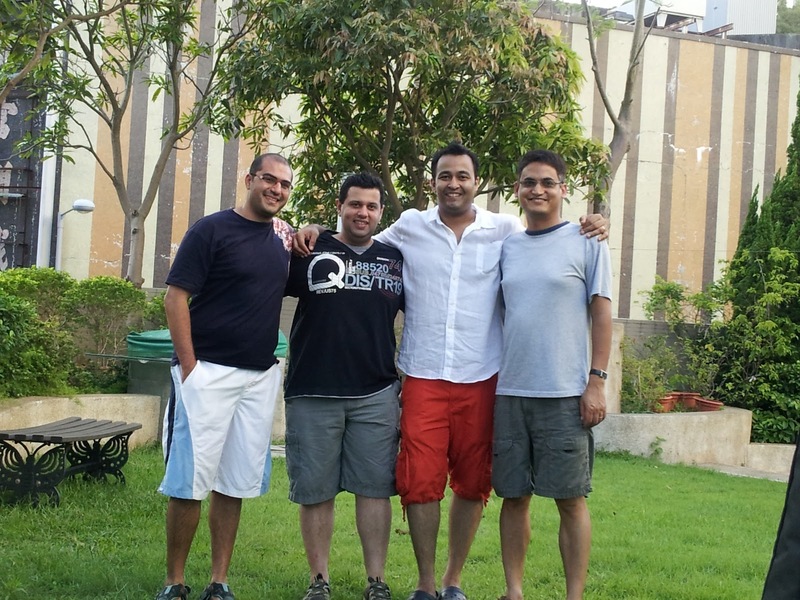 lots of friends with kids thrown in – AN ABSOLUTE MUST! A lot of planning had gone into the menu, so I was fairly organised on the day. The day started off well with not a cloud in the sky so I didn’t have to rush to the HK Observatory website to find out the status of my well planned bbq. 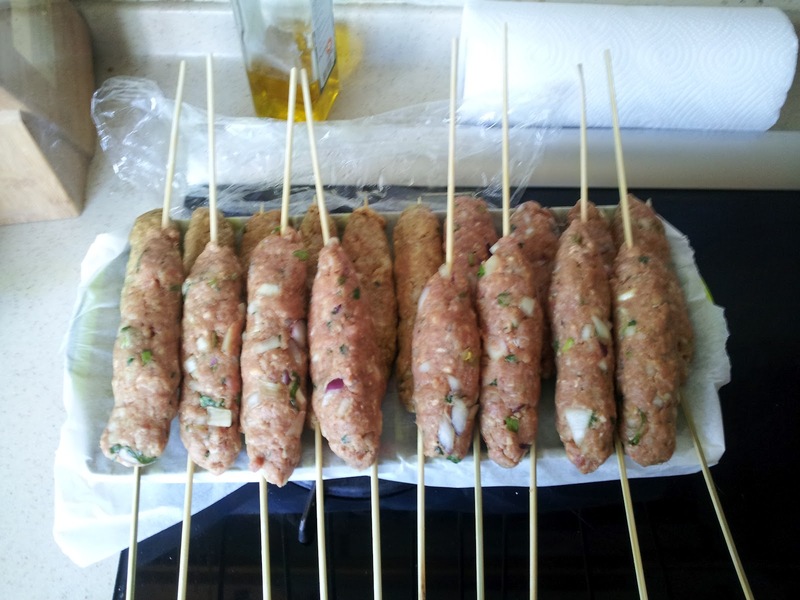 I had marinated most of the meats the night before but what I still had to do was to put the kababs into the wooden skewers (I was doing this for the first time) and managed alright. However after I finished with them and counted the number of sticks they clearly looked inadequate just considering my husband’s appetite! So my husband had to go for a quick round of the supermarket for more mince! I quickly finished the rest of the work including preparing the salads and side dishes. What I had not planned or prepared for was the limited fridge space that I had and I kept struggling to fit all my dishes in there, finally I gave up and switched on all the air conditioners at home and started putting the dishes on the dining table which worked just as well. It was almost time and while I started to carry the stuff downstairs, (must have made endless number of trips and that is with the boys helping), my husband went for another round of the supermarket to get ice, as we only had ‘that’ much space in the freezer with the ice cream boxes sitting plus some regular junk. The day was getting hotter and I was glad that we had also booked an indoor function room which held the food till I got the barbecues set. This was my very first bbq and when the management guard handed over just a lighter to me, I tried hard to explain to him that I have no clue how to light a bbq! He only speaks Cantonese but did manage to understand my plight saying that or rather gesturing that he can’t leave the desk unmanned so I have to figure it out myself! Luckily I found my friend’s maid hanging out there and she showed me how to light one….thank goodness one thing taken care of! Feeling the heat outside I also got some sun shade umbrellas put up with the help of the lifeguards who were not really in the mood of carrying two heavy parasols and fixing them just so that some guests don’t get burnt! Anyway that was done, the bbqs were lit, the tables set with food and the first thing I put on the bbq were sausages for the kids, who were eyeing the Doritos pack since a long time! By the time the first guest arrived, hot dogs were almost ready, the packet of chips were opened up and the party was getting set in motion. I do agree that I had to first request and then bully some of my lady friends, who were having a nice chat under one of the shady umbrellas, to make their way towards the bbq and take over some of the cooking. After one fallen kebab, a few stuck on to the grill, and some of them with sticks coming out, we had a decent batch of kababs and chicken coming out. 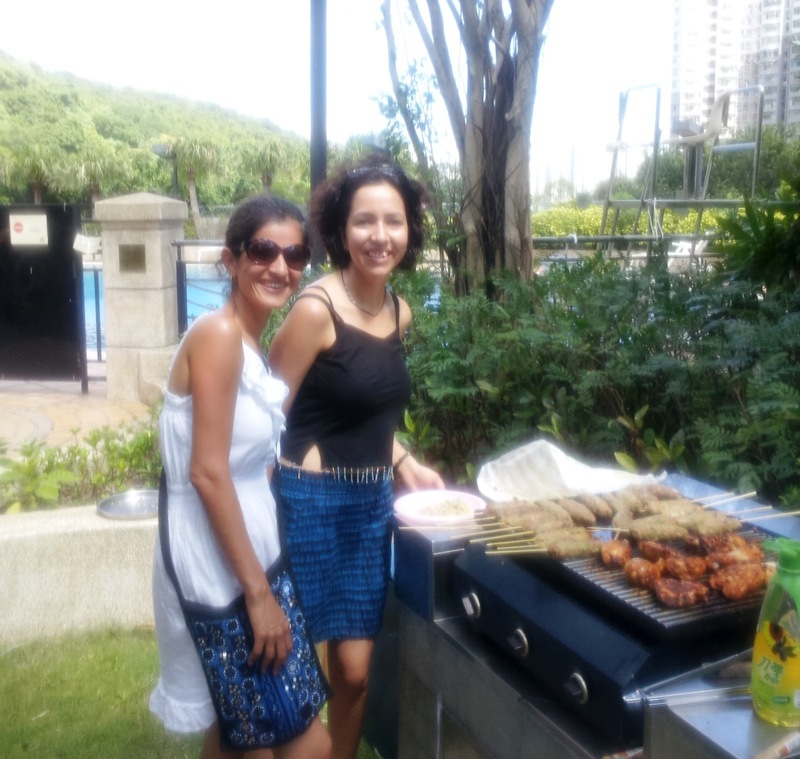 I later learnt that it was 1st time bbq for everyone! We had two separate bbqs so we had set the vegetarian dishes on one end and the meats on the other. My guests were quite at ease and everyone made themselves comfortable….in fact a vegetarian kid having an ‘innovative’ hot dog but instead of a sausage he was filling the bread roll with doritos and ketchup! 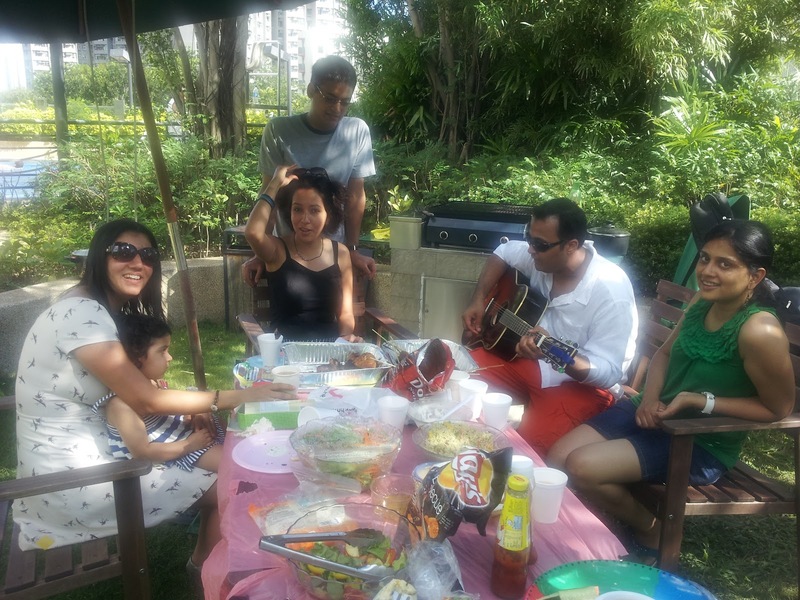 One of our friend’s parents visiting HK had taken also the time out to join us for the bbq and I was a bit unsure that they might find the setting with the wooden benches and a hot blazing sun a bit too uncomfortable. But they seemed to be doing fine too and thanks to the indoor playarea the younger kids and their mums kept themselves cool. The chicken and kebabs were well eaten and appreciated (thank God I had made a new batch this morning), the cous-cous salad was sought after too (made it for the first time) so I was mighty pleased! However the roast potatoes and the baked dish was almost untouched and will have to be eaten now by me, since I refuse to throw any edible food away specially one that is prepared by myself….no chance! Once our bodies got accustomed to the afternoon sun, the wine and beer bottles disappeared from our make-shift ice bucket and the kebab making got slower at the bbq, some people left for the pool with the kids while the others lingered around the table drumming their fingers and singing to the guitar string melodies of one of our very talented friends. I was torn between the two options but since I got no company for swimming from my lady friends, I gave up that idea and just sat down and enjoyed my tea and the music. How the hours passed away I had no clue as the first of my guests came to say their goodbyes. It was then that I suddenly realised that I had not served the icecream! I had left it for the end in my freezer as I obviously did not want to serve milk-shake to my guests! So the final dish of the day was served which was more obviously more appreciated by the children. In fact my younger son who had not eaten anything more than chips came to me and asked for a ‘dog-hot!’ 🙂 Thankfully the bbq was still hot and I made some quick sausages for him. One by one most of the guests parted, specially the ones with younger children who were exhausted by all the running around by then. While they all complimented me and my cooking, the best compliment for me was the one given by the mother of my friend who was here on a visit from Mumbai. It felt so nice to listen to and talk in Marathi after a long long time and I loved it when she said ” Thank you very much खूप चांगला ओर्गानिसे केलाला.” (very well organised). At 5 pm sharp the management guard came to switch off the bbqs but the party still went on with a few of us just sitting and relaxing. I had a great day and I hope everyone else did too. All this wouldn’t have been possible wihtout the help of friends who chipped in not only to cook but also to clear up and stack away things. I almost forgot I was in HK where maids and helpers reign and honestly never missed one even for a minute. At the end of the day after the dishes were cleaned and the house tidied up, I sat down to finish my left-over cous-cous salad and while I sat I couldn’t help thinking about this saying ‘We may not have it all together, but together we can have it all’. I truly appreciate the spirit and enthusiasm of my guests whether 6-weeks old or 60 to come for the bbq and make it such a special event for all of us. Thank you for making my day! Wowow Mehroo, my mouth is watering….especially now, since its nearing lunch time! Recommend that the photos be a bit larger in size! Hi Anonymous, thank you for your lovely comment. About the photos will keep your suggestion in mind next time but honestly I don't feel very comfortable using photographs of friends/family hence try to downplay them.